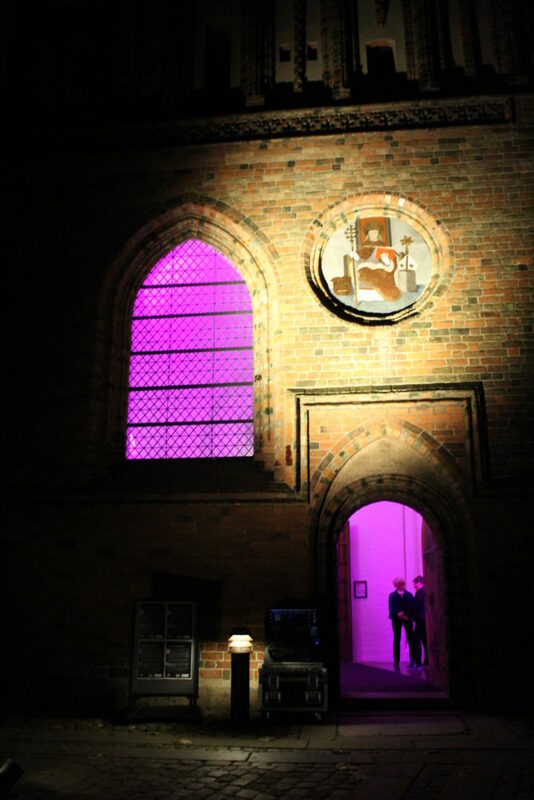 Roskilde marks the area around its cathedral, a world heritage site, with innovative character lighting. The goal of the project is to make visible the cultural alley in the town centre of Roskilde in a subtle and interesting way. 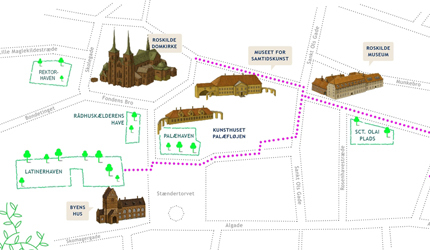 The cultural alley consists of a range of cultural institutions: Roskilde Cathedral, the City House (Byens Hus), the Museum of contemporary art, Roskilde art association, Roskilde Museum, St. Catherine’s Priory and Roskilde Library. The cultural alley runs parallel to the Roskilde shopping street and offers a tranquil and cultural alternative to vibrant city life. The easy way to make the cultural alley better known would be to place a “red carpet” in the pavement or set up signs Instead, we chose to work with lighting as a means of raising awareness of the institutions. In 2016, the municipality of Roskilde tendered the task of designing light for the cultural alley. 11 lighting designers offered their takes on the task and the choice fell on Jesper Kongshaug LightingDesign.dk. Kongshaug was chosen on the basis of his experience and previous works, among them Ragnarock in Roskilde, Den Blå Planet (an aquarium in Copenhagen) and Tivoli, but also the cooperation process with the parties involved that he presented in his application. The seven cultural institutions and the municipality of Roskilde had as early as 2013 initiated a collaboration and the mode of cooperation between the institutions has from the beginning been an important factor in geting the ideas to take root. The result was that Roskilde Municipality acquired 64 major and 56 smaller battery-powered lamps from the company CableFree LED. The purpose of the lights being battery-powered, is to create a great deal of flexibility, dynamism and variety. In that way, the differences between the institutions holding larger events and regular everyday lighting can be displayed. In addition to the movable lamps there is a range of distinctive old trees on the route from Roskilde Library to the cathedral. In connection with the implementation of the lamps, the institutions have participated in a workshop led by Kongshaug and employees from CableFree LED. The workshop and the cooperation have resulted in all the institutions having gained a great deal of commitment and ownership of the project. 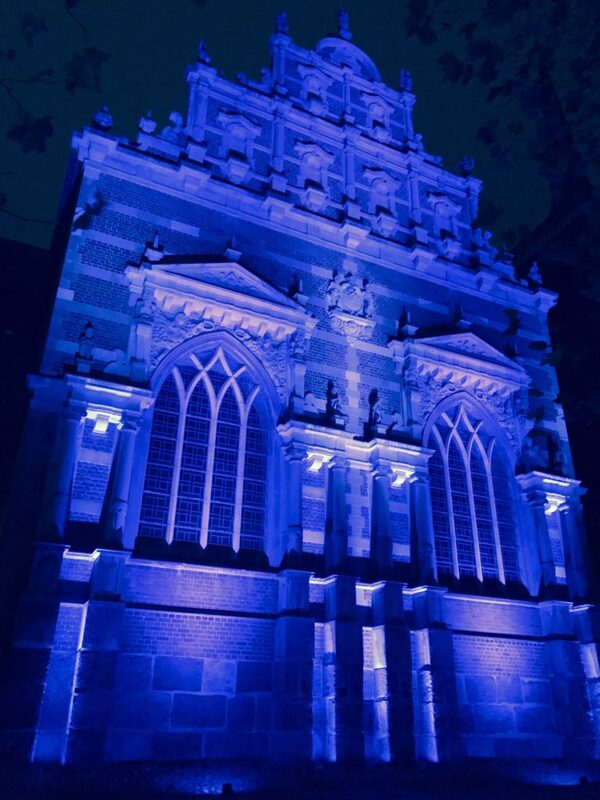 The lamps have been used in an artistic context in conjunction with Roskilde Festival of lights in november 2017, for the Christmas fair in Roskilde Cathedral Christmas 2017 and at the 2018 Cph Light Festival. 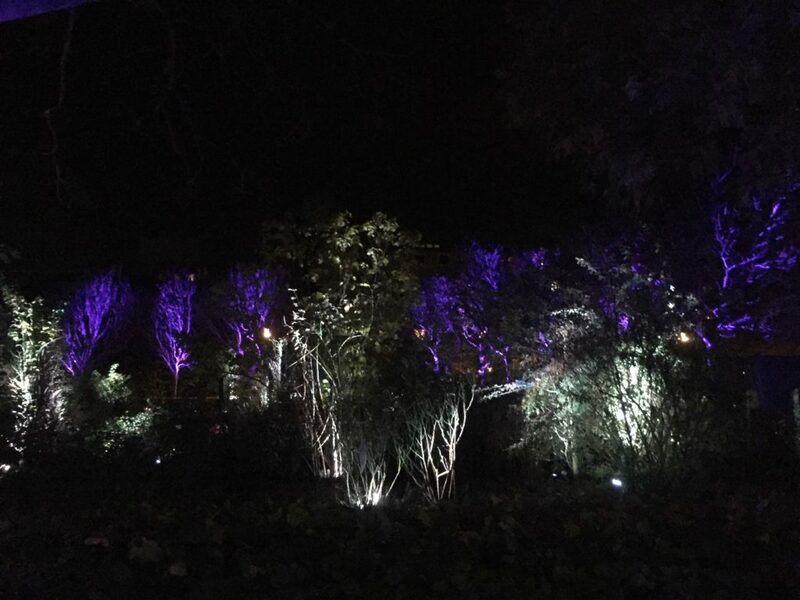 At the festival of lights it was clear that a great many visitors specifically targeted the two setups created by Jesper Kongshaug for the festival. We have learned that a process in cooperation with so many partners takes up more time and a lot more resources than anticipated. Roskilde Cultural Alley – a stretch from the Roskilde Cathedral,Domkirkepladsen 3 in Roskilde through Stændertorvet, Palæstræde, Sankt Ols Stræde to the Roskilde Library, Ved Klosteret. More lamps would be one investment to be made, for a greater part of the cultural path to be lit at the same time and new and artistic light installations will always be possible to set up with the current equipment, if cooperations with new and innovative artists should occur. Roskilde Cathedral, Domkirkepladsen 3 – Roskilde Bibliotek, Ved Klosteret. The aim of the project is to attract visitors to the wider world heritage area, beyond the cathedral, by enriching the experience of visitors, as well as the inhabitants daily lives.